I have decided to share some of things that inspired me and I was thinking of using them in my own short film which I intend to shoot in the spring. I was fascinated by lighting, colors, composition or technique. It is not easy to understand the shot because of the titles but it is a shot of the road seen from inside the car. 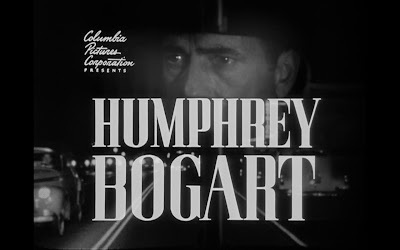 On the rear window, we see the reflection of Humphrey Bogart driving. It is a close up of his face. I thought about reproducing this shot in a way that I would shoot the road and the close up of the reflection separately and I would combine them together in the editing software. I think that would create a sort of a different surreal feeling, a combination of different shots coming together to create a linear whole within the composition. And by doing it with very clear, sharp and colorful image by using an HD camera, it will possess an absurd look. But I am not really sure how it is going to end up! I also like a composition to have layers and hierarchy within it. I believe without those, it doesn't mean anything. This is a shot from Almodóvar's film, I love the way he plays with color. Red always signals the victim but in this particular shot, it is the telephone. The director, here, probably refers to the character who is going to call, we don't see him, but he is the Fabula. Yet without showing that character, Almodóvar points out that he is the victim. It is very clever. In his last film, the color red plays a major role in the film. Red presents the hierarchy between the characters and changes all the time by their power, love, lust or misery. My favorite scene from Broken Embraces can be viewed here. The way Almodóvar chooses to use elements of pop culture fascinates me. I decided I have to combine my own work with pop references and one of the magazine that is very important for me is "Les Cahiers du Cinéma". That magazine was very important for the foundation of the New Wave French filmmakers and it is still a very important film magazine for world cinema. I don't know how am I going to use it but I just want to combine it with a very self reflexive way! barbaros bizimle paylaşmadığın bi hikayen mi var canım? hahaha keske olsa! olması için kafamı yerlere vuruyorum.